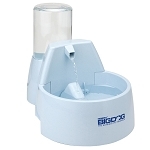 Provides 128 oz (1 gallon) of fresh, filtered water for your pet. The 360's multiple streams and circular design allows pets to drink from any angle and is great for multiple pet households. Multiple free-falling streams of water entice your pet to drink more and continually aerate the water with healthful oxygen. Developed by a veterinarian, the Drinkwell® 360 Stainless Steel Pet Fountain provides 128 oz (1 gal) of fresh, filtered water to your pet. A charcoal filter removes bad tastes and odors, giving your pet the best way to stay hydrated. 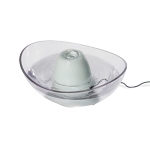 The 360's multiple streams and circular design allows pets to drink from any angle and is great for multiple pet households. 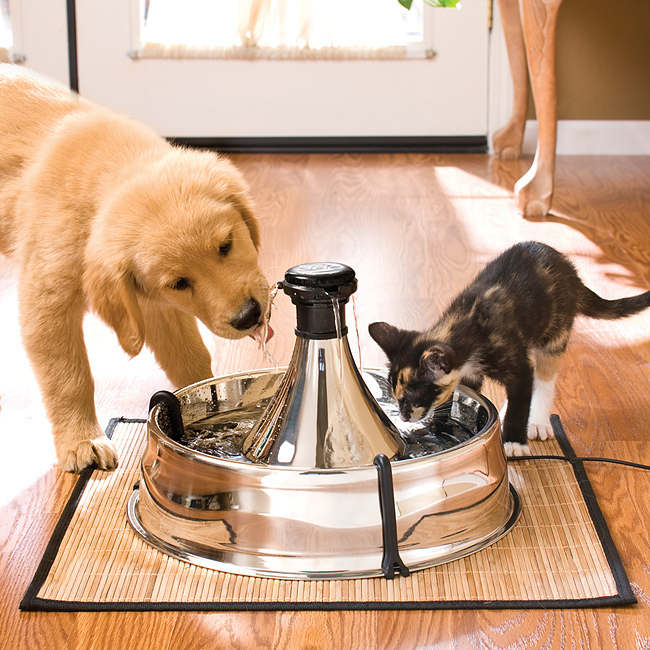 Stainless steel is the #1 material recommended by vets for the most hygienic pet dishes. Replaces SKU D360SS-RE. I like that this fountain has an inner filter plus and filter around the pump in the water bowl. Easy to clean. Looks nice. My cat who always wants to drink out of the sink really likes this fountain, and I can see that both of my cats are drinking water more now that I have it. Bought a different brand (in plastic) before this one. My cats kept sticking there paw in it and it would actually make the top part come off and then the water wouldn't flow, so I returned it. With this one there are no problems. They stick there paw in but all the pieces are held together well. Before we got this fountain - our 3 cats "bugged us" to get drinks out of the bathtub - now they drink from the fountain because the water is now fresh like to tub spout and always circulating and easy to keep clean. I little tricky to put to together, instructions could have been clearer. If the cats ever get over their fear of the sound it may be fine. It's been nearly a month and they are still scared of it. They prefer their quiet water bowl. Excellent! So far so good! This is a great product. I may buy another one. It's nice and quiet. It's a good price for excellent quality. I'm really impressed. My cat is no longer in my sink. Yeah! My cats aren't thrilled with it. The Drinkwell 360 is wonderful! My cats were always at the sink looking for water. As soon as I got it put together and plugged in, they were at the fountain drinking! The unit is also very quiet, you can barely hear it running. All four of our cats are drinking so much more water now, which is great - trying to head off any kidney or urinary tract/bladder issues down the road. Our tomcat stopped drinking out of his plastic fountain and started demanding water from the kitchen sink faucet. Thought there might be bacteria build-up in his 10 year old plastic fountain, so we purchased this. He loves it. Our manx/bengal mix, who wouldn't drink out of the plastic fountain also loves it. Would highly recommend it :) Also, fast shipping! It took a little while to get used to, but my 2 cats love it. One of my cats love it. The other one is afraid of it. I put his bowl right next to the fountain so he would get use to it. So far he is still drinking out of his bowl and not the fountain but at least he is close to the fountain and doesn't seem to be afraid of it. Soon I will remove his bowl and see what happens. I already had 2 larger Drinkwell water fountains which many of my 16 cats used daily. However they were the microban plastic kind. Several of my cats had developed cat acne under their chins and around their mouths, and I suspected plastic to be the culprit. I changed all feeding dishes to ceramic and stoneware and the water fountain to the Drinkwell 360--stainless steel. It took a few days, but now everyone is drinking from it. Acne is disappearing from their mouth areas. Very good product and very good company. 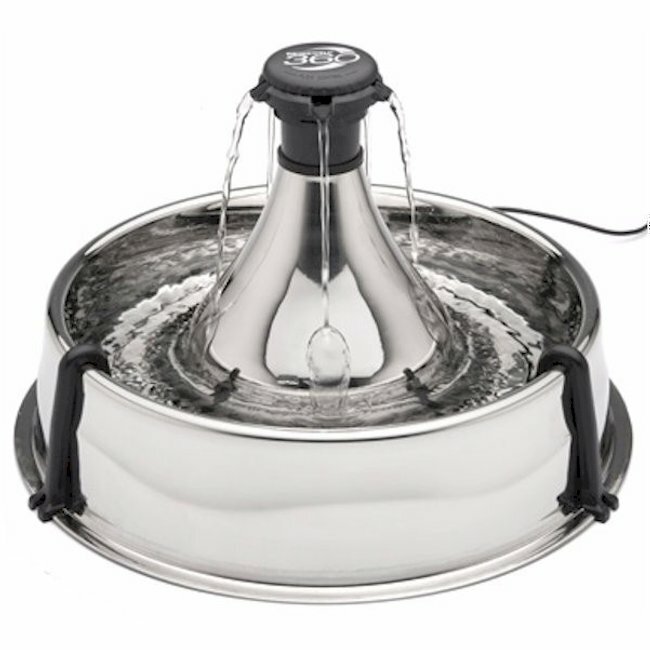 We bought this fountain after years of using the Drinkwell plastic version because we thought the stainless steel would be easier to clean. On one hand, it is easier because there are not tiny places to reach into, but the quality of the stainless is so thin that I'm not impressed. I imagine if you only put distilled water in it you would not show hard water stains, but I used water from the tap (in Irvine, CA) and have not been able to clean off the stains after about 6 months of use. There is nothing wrong with it, I would just like it look "clean" and it doesn't even after trying with Bar Keepers Friend. 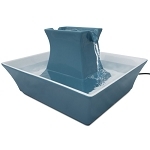 We have 2 Himalayan cats and both enjoy the fountain though, and I do like that you can adjust the flow down to be very quiet or turn it up higher for a larger cascade. Best stainless steel fountain yet! We've had the fountain for a couple of weeks now...the cat will not drink out of it...we put it next to the sink to start out...then on the floor away from her food...then on the floor where her water bowl used to be...we've tried the single and the double flow caps...we've tried tap water and distilled water...using the filter...do you suppose she wants just tap water with no filter?! We have a well, so she may be tasting something we don't taste in the tap water! Can the unit be used without a filter? If you have any suggestions, please let me know! Thank you... RadioFence.com Response. Please all us at 941-505-8220.